EDC is excited to announce Twisted Bine’s grand opening during the weekend of July 27th. EDC’s relationship with Twisted Bine started through the Boroughs Collaborative and continues with the facilitation of an SBA 504 loan. 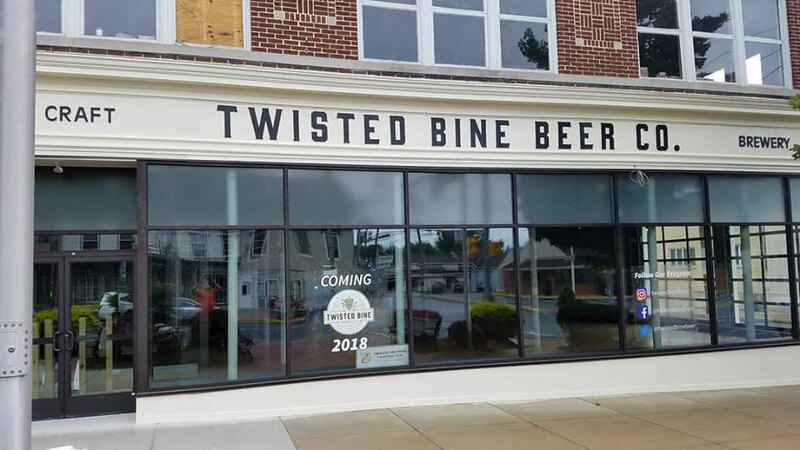 Twisted Bine Beer Co., a new restaurant and brewery, has opened in Mount Joy. The brewpub at 93 E. Main St. will have limited hours this weekend but is beginning normal operating hours this week. Encompassing some 5,000 square feet at Main and Barbara streets, Twisted Bine features a roughly 100-seat restaurant and a seven-barrel beermaking system. Twisted Bine makes a variety of seasonal beer styles, offering eight on tap at a time alongside a few beers from other Pennsylvania brewers. The restaurant menu features traditional bar food such as burgers and sandwiches. The Lowells, who announced the opening on Facebook, did not respond to a message left seeking more details. The Lowells, who bought the property in June 2017 for $362,500, oversaw extensive renovations to what had been a furniture store, including updating the heating, ventilation and air-conditioning systems. The work also revealed the original wooden floors, beams and bricks of the circa-1923 building. And new glass was put in the front of the building as well as glass garage doors on the side that can be opened in warm weather. The project’s cost was not disclosed.